Analog Artist Digital World: Salvador Live at the Outdoor Fringe Tent. The world’s most dynamic break dancing speed painter known as “Salvador Live!” brought his talents to Fringe making a special live performance during Hop Hip Night at the free outdoor stage. 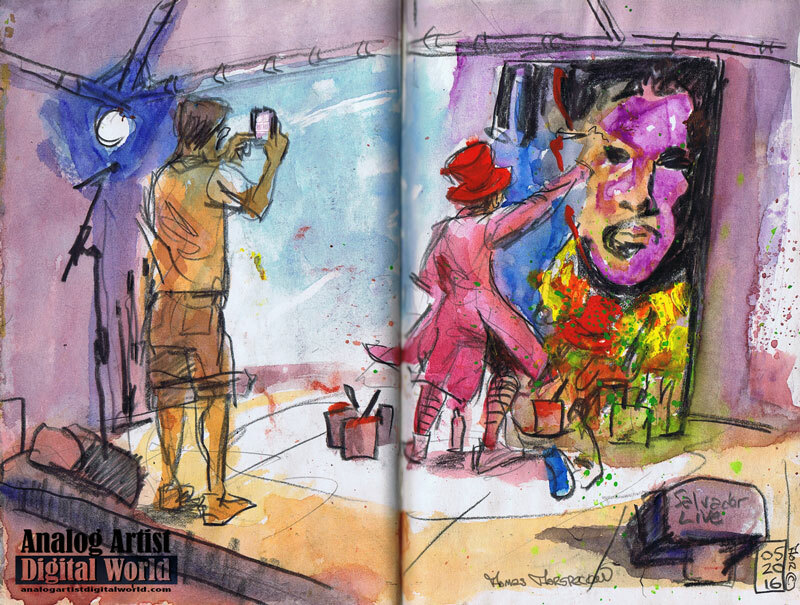 Salvador wowed Fringe goers with his compelling live painting experience with the added twist of dance and theatrical elements. Using his performance expertise and incorporating a variety of special characters and themes, Salvador Live engaged, inspired and impressed his spectators delivering a truly unique, unforgettable experience. I had to work quick to catch him in action. Prince songs inspired his creation. Within minutes Prince's purple face began to appear on the five foot canvas. I wondered how he could get a likeness so quickly. After watching him work, I have my theories, but prefer to simply accept it as theatrical and artistic magic. Salvador would break dance and spin on his head between songs. He spent as much time dancing and voguing as he did painting. Amazed spectators took video and or photos on their cell phone. The performancebuild up to Prince's "Purple Rain." Before I knew it, he us done. I had to keep adding color washes after he left the stage. I was exhausted from just watching him. While walking on Park Avenue in Winter Park, I passed an angry youth sitting on a bench shouting into his phone. "You know they killed Prince don't you?" As conspiracy theories build, Prince' myth lives on.